صدقی, مهرداد, سرائیان, احمدرضا, افرا, الیاس, امینیان, هدایت اله, افشارپور, مریم. (1397). تاثیر کهنگی حرارتی و حرارتی رطوبتی بر ویژگی‌های کاغذ تیمار شده با نانوهیدروکسید کلسیم و نانوکیتوزان. مجله صنایع چوب و کاغذ ایران, 9(2), 277-288. مهرداد صدقی; احمدرضا سرائیان; الیاس افرا; هدایت اله امینیان; مریم افشارپور. "تاثیر کهنگی حرارتی و حرارتی رطوبتی بر ویژگی‌های کاغذ تیمار شده با نانوهیدروکسید کلسیم و نانوکیتوزان". مجله صنایع چوب و کاغذ ایران, 9, 2, 1397, 277-288. صدقی, مهرداد, سرائیان, احمدرضا, افرا, الیاس, امینیان, هدایت اله, افشارپور, مریم. (1397). 'تاثیر کهنگی حرارتی و حرارتی رطوبتی بر ویژگی‌های کاغذ تیمار شده با نانوهیدروکسید کلسیم و نانوکیتوزان', مجله صنایع چوب و کاغذ ایران, 9(2), pp. 277-288. صدقی, مهرداد, سرائیان, احمدرضا, افرا, الیاس, امینیان, هدایت اله, افشارپور, مریم. تاثیر کهنگی حرارتی و حرارتی رطوبتی بر ویژگی‌های کاغذ تیمار شده با نانوهیدروکسید کلسیم و نانوکیتوزان. 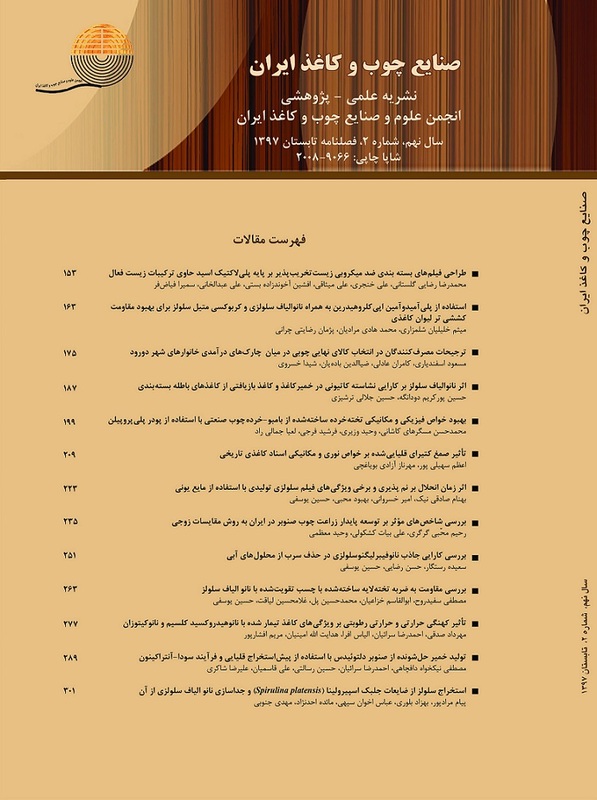 مجله صنایع چوب و کاغذ ایران, 1397; 9(2): 277-288. کاغذ به‌ خاطر ویژگی‌های ساختاری خود به تدریج توسط عوامل مخرب مختلفی به ویژه هیدرولیز اسیدی تخریب می‌شود. به همین دلیل اسیدزدایی از کاغذهای با ارزش قدیمی به منظور توقف و خنثی کردن این فرایند و نیز اعمال تیمارهای استحکام بخشی برای تقویت کاغذهای تخریب شده ضروری است. در این پژوهش برای اسیدزدایی کاغذ و تقویت بافت آن با استفاده از پراکنده سازی نانوهیدروکسید کلسیم و نیز نانوهیدروکسید کلسیم همراه با نانوکیتوزان در اتانول، یک نانو پوشش بر روی سطوح کاغذ نمونه اعمال شد. همچنین به منظور بررسی تاثیر تیمار اسیدزدایی و مقاوم‌سازی، نمونه‌ها در معرض کهنگی حرارتی و کهنگی حرارتی رطوبتی قرار گرفتند و مقدار pH، مقاومت به تا شدن و روشنی کاغذهای تیمارشده، قبل و بعد از کهنگی مورد سنجش قرار گرفتند. نتایج حاصل از بررسی ویژگی‌های شیمیایی، مکانیکی و فیزیکی کاغذهای تیمار شده قبل و بعد از کهنگی نشان داد که استفاده از نانوذرات هیدروکسید کلسیم منجر به افزایش قلیاییت کاغذ و بهبود درجه روشنی آن شد و استفاده از نانوکیتوزان در ترکیب با نانوهیدروکسید کلسیم نیز موجب بهبود خواص مکانیکی کاغذهای تیمار شده گردید. اما بعد از کهنگی حرارتی رطوبتی، مقاومت‌ کاغذهای تیمار شده حاوی نانوکیتوزان افت بیشتری پیدا کرد. همچنین از نظر خواص بصری نیز کاغذهای تیمار شده با نانوهیدروکسید کلسیم در قیاس با کاغذ شاهد و کاغذ تیمارشده با ترکیب نانوهیدروکسید کلسیم نانوکیتوزان، از پایداری بیشتری برخوردار بود. Strlič, M. and Kolar, J., 2005. Ageing and Stabilization of paper. National and University Library of Ljubljana, 196 p.
 Baty, J.W., Maitland, C.L., Minter, W., Hubbe, M.A. and Jordan-Mowery, S.K., 2010. Deacidification for the conservation and preservation of paper-based works: A Review. Bio Resources, 5(3): 1955-2023. Area, M.C. and Cheradame, H., 2011. Paper aging and degradation: recent findings and research methods. Bioresources, 6 (4): 5307-5337. Zervos, S., 2010. Natural and accelerated aging of cellulose and paper: A Literature Review. Cellulose: structure and properties, derivatives and industrial uses, New York,, Nova Publishing. Pp 42. Zervos, S. and Alexopoulou, I., 2015. Paper Conservation Methods: A Literature Review.Cellulose, 22( 5): 2859–2897. Hubbe, M. A., Smith, R. D., Zou, X., Katuscak. S., Potthast, A. and Ahn, K., 2017. Deacidification of Acidic Books and Paper by Means of Non-aqueous Dispersions of Alkaline Particles: A Review Focusing on Completeness of the Reaction. BioResources, 12(2), 4410-4477. Sequeira, S., Casanova, C. and Cabrita, E.J., 2006. Deacidification of paper using dispersions of Ca(OH)2 nanoparticles in isopropanol. Study of efficiency. Journal of Cultural Heritage, (7): 264-272. Poggi, G., Giorgi, R., Toccafondi, N., Katur, V. and Baglioni, P., 2010. Hydroxide nanoparticles for deacidification and concomitant inhibition of iron-gall ink corrosion paper. Langmuir, 26 (24): 19084-19090. Botty, L., Mantovani, O., Orru, M.A. and Ruggeiero, D., 2006. The Effect of sodium and calcium ions in the deacidification of paper: a chemo-physical study using thermal analysis. Restaurator, 27 (1), 9-23. Konuklar, M. and Sacak, M., 2011. A new method for paper conservation: triple mixture of methyl cellulose, carboxymethyl cellulose and nano-micro calcium hydroxide particles. Hacettepe journal of biology and chemistry, 39 (4): 403-411. Giorgi, R., Dei, L., Ceccato, M., Schettino, C. and Baglioni, P., 2002. Nanotechnologies for conservation of cultural heritage. paper and canvas deacidification. Langmuir, 18:8198-8203. Fellers, C., Iversen, T., Lindström, T., Nilsson,T. and Rigdahl, M., 1989. Aging /degradation of papers. FoU-projecet for papers conserving. Report no 1E. ISSN 0284-5636, Stockholm. 139 p.
 Ardelean, A., Nicu, R., Asandei, D. and Bobu, E., 2009. Carboxymethyl-chitosan as consolidation agent for old documents on paper support. European Journal of Science and Technology, 5(4): 67-75. No, H. K., Park, N. Y. Lee, S. H. and Meyers, S. P., 2002. Antibacterial Activity of Chitosan and Chitosan Oligomers with Different Molecular Weights. International Journal of Food Microbiology, 74:65-72. Vizárová, K., Kirschnerová, S., Šutý, Š., Tiňo, R. and Katuščák, S., 2008. Strengthening and deacidification of acidic Ground wood paper with the Ternary system Chitosan, methyl- hydroxyethyl cellulose - cationic starch in Mg (HCO3)2 aqueous solution. Durability of paper and writing 2, 2nd international symposium and workshops Ljubljana, Slovenia July, 7-9. P: 53-55. Ciolacu, F., Nicu, R., Balan, T. and Bobu, E., 2017. Chitosan derivatives as Bio-based materials for paper heritage conservation. Bioresources, 12 (1): 735-747. Karlovits, M. and Gregor-Svetec, D., 2012. Durability of Cellulose and Synthetic Papers Exposed to Various Methods of Accelerated Ageing. Acta Polytechnica Hungarica,. 9(6): 81-100. Scott, W.E., Abbot, J.C. and Torrest, S., 1995. Properties of paper: An introduction, 2nd Ed. TAPPI press, Atlanta, GA.
 Cocca, M.., D’Arienzo, L. and L. D’Orazio., 2011. Effects of Different Artificial Agings on Structure and Properties of Whatman Paper Samples. International Scholarly Research Network ISRN Materials Science Volume 2011, Article ID 863083, 7 pages. Ardelean, E., Bobu E., Niculescu, Gh. and Groza, C., 2011. Effects of different consolidation additives on ageing behaviour of archived document paper. Cellulose chemistry and technology, 45 (1-2): 97-103.